In legal terms, graffiti is still considered an illegal sign of vandalism. It usually happens without permission. A mural is a type of graffiti but normally occurs when the owner of the wall requests it. However, graffiti art is alive and well in Phoenix, Arizona. Its bustling streets serve as a blank canvas where the city’s artists display their visions of making neighborhoods more colorful. Roosevelt Row houses many of those murals. This creative district is located in downtown’s urban core. Many of the restaurant walls show off their painted murals here, but you can also find them in the local PHX art galleries. Tato Caraveo is one of the main artists responsible for making vibrantly colored murals with distinctive character designs. One of his creations is displayed on Roosevelt Row. He has been making art since he was a child. In high school, he progressed to graffiti art and mural art. As an adult, his focus remains on the latter because he appreciates its form. In his words, all art makes communities livelier. Adding color to any city, not just Phoenix, sets it apart from a beige world to which people have become accustomed. Murals make a city exciting and interactive with residents and visitors. Caraveo usually creates murals simply for artistic value, not as a message canvas. However, some occasions call for message projection. Additionally, this type of art can inspire low-income youths to pursue art, and all communities have a chance to represent their voice even if it does end up getting removed quickly..
Hannah Reim was part of the ASU Graffiti Gang. This journalism sophomore once ran a website that explored graffiti in the valley. While this group no longer exists, it once focused on reclaiming graffiti as a positive expression. The website highlighted prominent signature murals and showcased the city’s graffiti culture. She thinks that the creative process of graffiti is just as beautiful as the end result. Phoenix has many talented artists who show that graffiti isn’t a crime. Instead, it beautifies the city. She cites Bienvenidos a Arizona as her favored Phoenix mural. 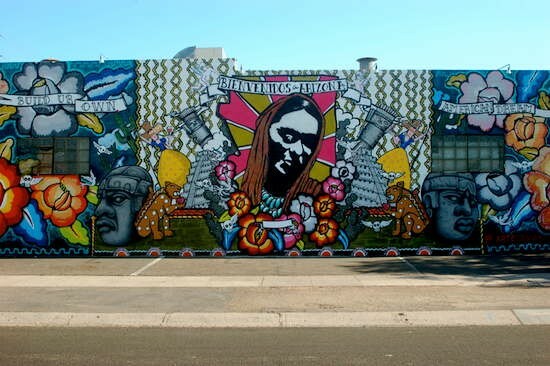 Created by DOSE and Gennaro Garcia, that one does come with an important message because it functions as a response to one of Arizona’s controversial immigration laws. The mural definitely transferred the neighborhood. Visitors can view it to learn about the local art scene and to find out about the support system between the Native American and Latin communities. Graffiti functions as a form of social art that transmits communication. Artists use it to connect with the public. Every piece of graffiti has an opinion behind it, whether it transmits an obvious message or not. That’s why it’s displayed on train cars or building walls. Despite the big presence in Phoenix, graffiti is still underappreciated in the rest of the Phoenix Metro Area in Arizona. This applies especially when you compare it to other undervalued art forms, including painting and tattooing. Yet, the graffiti in the city is representative of the state as a whole. It’s about people’s origins, Hispanic culture and what people cherish about their origins.